Minister Wakeling addressing NMIT Auslan graduates. 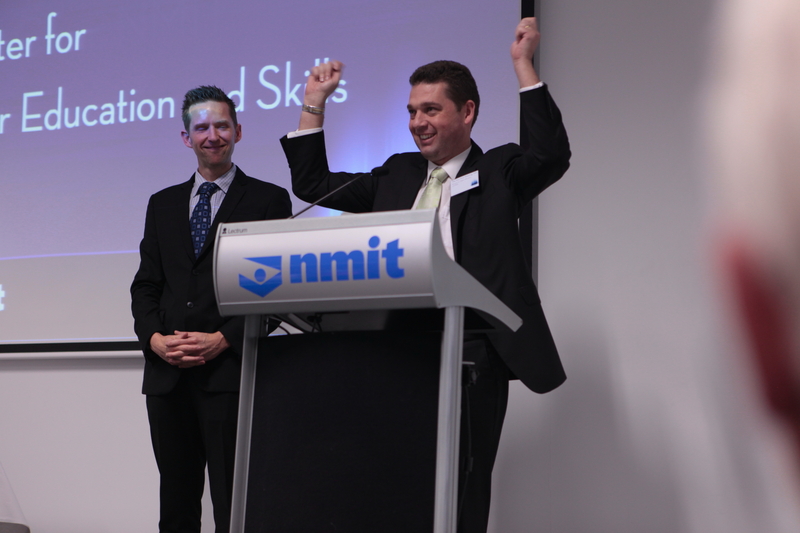 Around 60 Auslan students graduated from NMIT (Northern Melbourne Institute of TAFE) on 29 July at a ceremony attended by the Honourable Nick Wakeling, Minister for Higher Education and Skills. Minister Wakeling addressed the audience and assisted in the presentation of certificates to graduates. As part of his address, the Minister delivered a short message to the graduates in Auslan and worked with an NMIT Auslan teacher to learn the necessary signing. Auslan is the language of the deaf community in Australia, and is used by Deaf and Hard of Hearing people, their friends, immediate and extended family, co-workers and professionals such as Auslan interpreters. It is a visual, spatial language with its own grammar and syntax quite distinct from English. It is the primary language used by Australia’s deaf community and contributes to the quality of life of thousands of Australians. NMIT (incorporating deafConnectED) is part of the Victorian Auslan Training Consortium (VATC), which delivers Auslan training as a measure to increase the number of Auslan interpreters, and other professional pathways (such as teacher of the deaf) to support the educational, social and economic inclusion for Victorians who use Auslan as their primary language. The Auslan program at NMIT was launched during July 2013 and is a flexible, innovative program that maximises trainee participation and pathways to Auslan interpreter training and other employment opportunities. Classes are offered in both metropolitan and regional Victoria. Students commence learning at Certificate II in Auslan and can progress to the Certificates III and IV in Auslan, and graduate with the Diploma of Auslan prior to undertaking interpreter training. In addition to the approximately 60 students receiving their awards at the graduation ceremony, around 30 NMIT Auslan students also received graduation certificates in absentia.